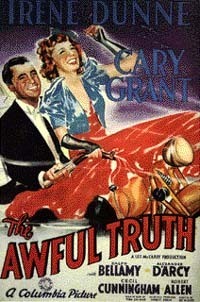 The Awful Truth is a 1937 screwball comedy film starring Irene Dunne and Cary Grant. The plot concerns the machinations of a soon-to-be-divorced couple, played by Dunne and Grant, who go to great lengths to try to ruin each other's romantic escapades. The movie was directed by Leo McCarey, who won the Academy Award for Best Director. It was written by Sidney Buchman (uncredited) and Viña Delmar from the play by Arthur Richman.